Timber, bamboo and laminates are specified for different projects for different reasons, from price and durability to ease of installation, sustainability and repair considerations. We are going to discuss the pros and cons of each of these flooring options and when it’s a good idea to consider a specific wood option. Side by side, timber, bamboo and laminates may appear to be similar. The material from which they are manufactured, however, makes them very different. Timber, otherwise known as solid or engineered wood is harvested from lumber and trees, bamboo is a type of grass and laminates are manufactured. Laminate multi-layer synthetic flooring is a product that is fused together with a picture of wood under a transparent sheet to give the look of real wood but not the feel or the structure and character. Price: Hardwood is priced at roughly R550 – R2 500 per square metre (installed). Softwood and plywood are much cheaper while exotic hardwoods are much more expensive. Durability: There are many different types of timber and both hard and soft timbers are used as flooring materials. Wood such as pine and fir are quite soft while red walnut and Brazilian teak have high hardness ratings. Hardwood can also be refinished, which leads to longer lasting floor installations when compared to other flooring options that will need to be replaced after a certain period of time. It is also important to research proper wood finishes as solid hardwood can stain and can be vulnerable to strong sunlight. Unlike engineered wood and laminates, which are composed of wood layers that are held together with adhesives, hardwood is a piece of solid wood from top to bottom. 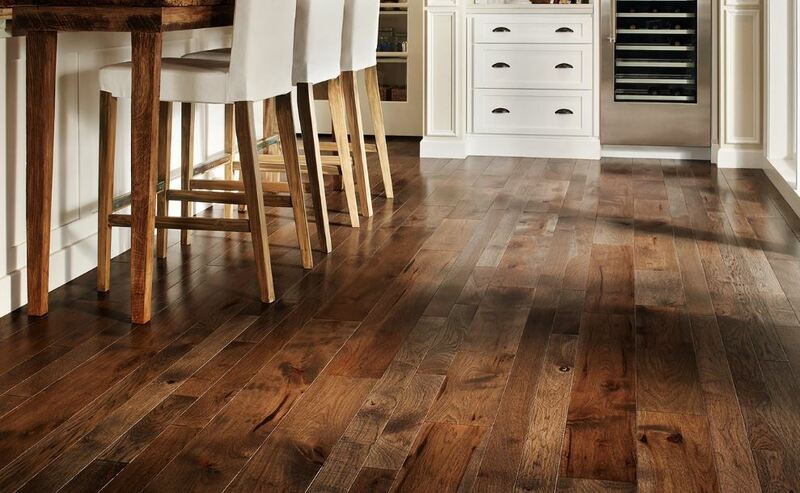 Another difference is that no fillers or adhesives are used with hardwood flooring. Engineered floors are 70% more stable than solid wood, because of the structural layers. Solid wood floors are indeed all solid wood from top to bottom but can only be used up to the tongue. Ease of installation: There are different ways to install hardwood flooring, such as glue-down, nail down, a sticky mat system or the “floating” method. Hardwood flooring is more difficult to install than bamboo or laminate flooring and this task should be left to experienced professionals. Sustainability: A tree can take over two decades to reach full maturity and be ready to harvest. Compared to bamboo grass stalks which reach full height in less than 5 years, it takes a much longer time to regenerate trees. An eco advantage of wood is that there is potential to be fewer CO2 emissions related to transport costs of timber because trees can be grown in a much wider variety of regions, allowing people to source timber from closer locations. Hardwood has a very long lifespan and it is also bio-degradable. Additionally, instead of recycling hardwood flooring, many organisations and manufacturers offer alternative ways to reuse it. Hardwood floors that are in a good structural condition can be safely removed and reinstalled in another area. Repair considerations: Regardless of the type of wood you choose, it will probably need to be repaired or replaced at some point because of general wear and tear. Common issues include light-coloured patches on well-travelled areas, stains and scratches, burns and acid damage, water damage as well as slight separation between boards. The decision on whether the floor can be repaired or whether sections need to be replaced will depend on the scope of the work involved as well as the type of damage. Repairs and replacement can be costly and should be undertaken by a professional. Price: Bamboo is usually priced in a range of around R500 to R900 per square metre, depending on the type and thickness. While you may be able to find cheaper bamboo options on the market, you run the risk of inferior quality flooring if you opt for cheap bamboo. Durability: In its natural, untreated state, bamboo is relatively hard when compared to many wood flooring options. Ease of installation: Bamboo can be installed on concrete sub-flooring with minimal effort. Be sure to use an experienced installer who has the right tools and equipment for the job. Sustainability: Bamboo is considered a very green and eco-conscious building material because bamboo grass stalks grow very quickly (they can attain full height in under five years). Bamboo is also biodegradable and can be recycled. Repair considerations: Over time, bamboo flooring can become scratched, discoloured or marred. The surface can easily be refinished by reapplying finishing coats to give it a face lift. Price: Laminates are very affordable because they’re mainly synthetic and can be produced on a large scale using low cost materials. As with any other floor type, costs range from high to low depending on the quality. Laminate flooring prices vary between R129 – R650 per square metre (installed). The cheaper end of the scale may have a Medium Density Fibreboard, which is generally not very hard wearing and may have to be replaced every 1 – 2 years. Durability: The durability of laminates will depend on the manufacturer or supplier of the product as well as the materials used for the flooring product. Some laminates are actually more durable than some hardwoods, so doing your research and investing in products that come with warranties will serve you well. Laminates are generally very hardwearing and a great solution for kid’s playrooms and busy interior spaces. Quality laminates have HDF cores that are both water resistant and dimensionally stable. The surfaces are generally treated with Aluminium Oxide, adding strength and a high degree of scratch resistance. Product warranties often cover denting, staining, fading and manufacturer defects but they do not cover incorrect installation and everyday wear and tear. Ease of installation: Laminates are very easy to install because they use a click or lock assembly, which means that the flooring can be floated over most existing subfloors. Sustainability: There is a lot of green washing in any flooring category, but it is best to source laminate flooring from companies that have ecological product features and certificates for their environmentally sound and socially-responsible actions. The conditions under which production takes place and its impact on the ecology, economy and community are key contributors to the environmental sustainability of laminate flooring. Repair considerations: Minor scratches from daily wear and tear can easily be repaired with the aid of laminate floor repair kits (which include acrylic or latex putty). A lack of expansion space between the laminate floor and the walls can lead to ‘peaking’, which is when the laminate floor boards push up against each other and result in high points at the joints. This can be remedied by cutting the laminate board where it meets the wall to give it more space to expand. Other issues such as water damage, chipped corners and warping all have easy-to-follow repair techniques and damaged floor boards can also simply be replaced. Full thanks and acknowledgement are given to www.bedsonflooring.co.za, www.ecobambooafrica.com, www.floorsdirect.co.za, www.moso.eu, www.sawlfa.co.za, www.spruce.com, www.ask.metafilter.com, www.homeflooringpros.com, www.eplf.com, www.laminatefloorings.net, www.armstrong.com and www.flooring-professionals.com for the information contained in this article.